Good morning!!..... 19 years ago I fell in love with a place that symbolized so many things that I had always intrigued me. Beautiful rolling hills as far as the eye could see, pastures with livestock roaming and perfect pristine fences with sprawling barns and houses ...... A working ranch with real cowgirls and cowboys. The move to Lubbock took me thru Guthrie,TX several times a year ..... And my love for the four 6's ranch started with wonderment and day dreaming And then it turned to knowledge ....reading about the history of this beautiful place. I have actually become great friends with the sheriff of King County ( whole other story) and have talk to many regulars about this ranch, one even bringing me a 6666 ball cap..... A year ago, I was in pure chaos trying to get the grill under control with not a lot of social time.....in walked a man in jeans, cowboy boots a chambray button down and a hat perched a on his salt and pepper hair, I am instantly drawn to him because of I his hat, it's just like mine with the four simple 6666.... I get caught up and make my way to him and ask about his hat. We talk of his lively hood that involves working with horses, hence the hat. Our conversation then turns to his journey ..... His wife lives in a special needs home.... She was suffering from Alzheimer's for the last 5 years . He talked of taking care of her on his own for the first 3 years and then he needed help and so for the last two years he had never missed a day with her, always going to spend time with her at the home & more recently she had not a clue who he was.... Heartbreaking but he still continued to go. On this day he wandered into the grill after skipping lunch with her to take care of some business downtown...... By the time he left we felt as if we were old friends he had shared his heart breaking journey with a total stranger and in return I tucked it away in my heart and mind thinking of him often over time. Yesterday I was working on the pos system and I watch Krissy seat a guest. Dressed just the way he was a year before and that hat perched on his head my heart smiles , I cannot wait to go talk to him. Happy beautiful Wednesday y'all .... We greet each other like long lost friends and I ask how is precious wife is.... " tears welled in his eyes as he shares of her passing last week" .... His tears kill me .... This tough man that has such a colorful mouth to say the least, & has a rugged tough job has tears sliding down his face as he shares his love for her and his loneliness .." What do I do now I went a sat with her everyday? "Sitting very near by was an other guest that was living this mans life... His loved one living with Alzheimer's and slowly their life's were changing.... Ironically I have a sign hanging in the grill that reads .... "You only live once, but if you do it right once is enough" this sign was given to me about the wife of an Alzheimer patient..... I want to build relationship 's that even if they do not remember me I cherish just being with them. This stranger has allowed me a glimpse into a loved story that we all really want .... Absolute love and devotion!! Good Morning!! Yesterday I was surrounded by amazing people .......the kind of people that I want to be like.....they have given of themselves so freely with no hesitation, I felt as if I were a fish out of water and I was so honored to be among them.... 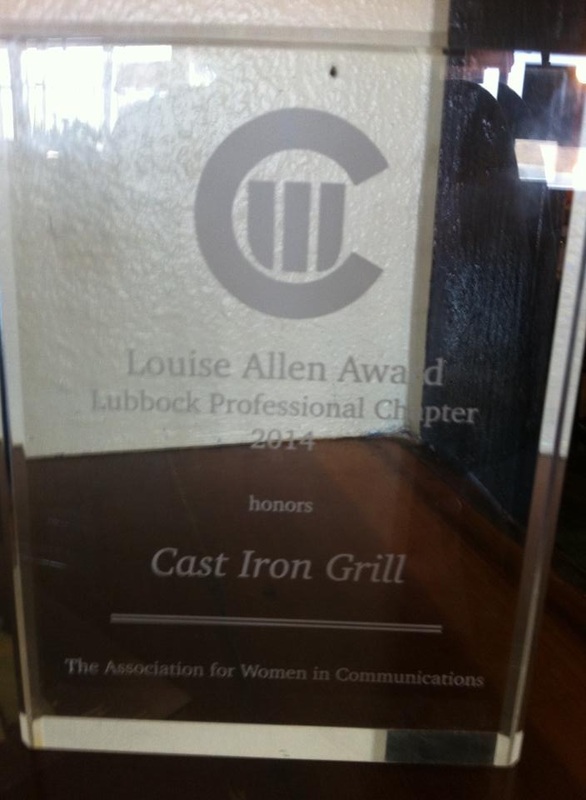 In January I received a call of congratulations," Teresa , the Cast Iron Grill is being recognized for its community service by The Association of Women in Communication, you will be awarded the Louise Allen award at a luncheon in April".... I honestly could not wrap my head around what she was saying and I had no words to express my heart, I felt so undeserving.... 4 1/2 years ago when Shelby and I felt the calling to use the grill to feed the hungry we didn't do it to be recognized... We did it because we were to use this amazing place to feed body, heart and soul for those that we're not able to feed themselves..... Shelby unselfishly wanted Sam to go with me to the luncheon..." Sam has cooked for St.Benedicts for 2 years he needs to go & realize what he does is important." .... Happy beautiful Wednesday y'all.... there are so many amazing people in Lubbock that do some extraordinary things & they are making a difference everyday in others life. 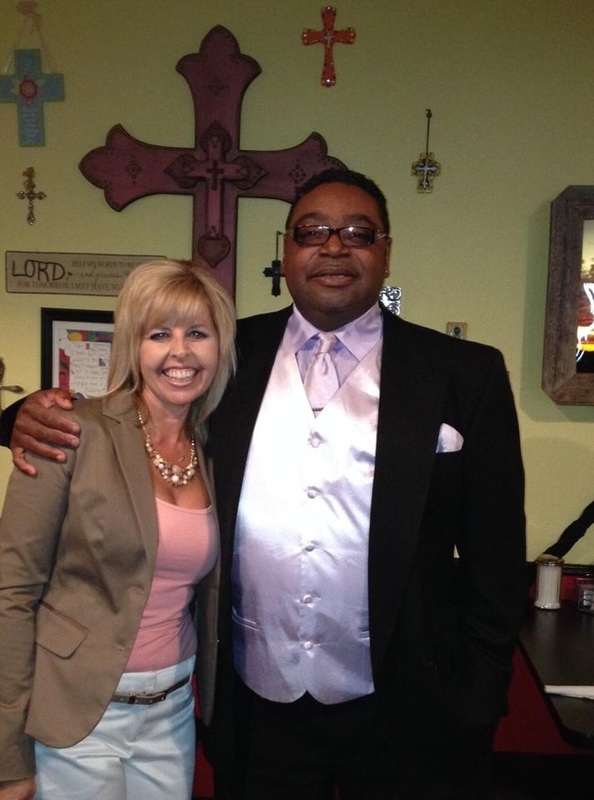 I had the great opportunity to meet Holly Edwards Betenbough....Betenbough homes sponsored the Cast Iron Grill table and she presented the award to me ... Being in her presence was amazing ...she exudes what Christ is .... Loving, giving, caring... I was so honored to meet her. My heart is overwhelmed with the kindness that has been shown to myself and to the CIG....I couldn't help but think, usually I am the " hired help" when it comes to luncheons and banquets ( which is what I love) and yesterday I was so humbled to be in the presence of others who personifies what our Heavenly Father wants us to be. Last night as I was sharing with Shelby about the days events, he became a little irritated when I told him I did not speak, " oh my gosh Teresa why not?" ..... I guess my fear of speaking but more than that i was so overwhelmed by the kind words were that were spoken about us and the grill I just couldn't ...I wanted to make sure I did not take away from what was said." Yesterday as I sat and listened about all of the other recipients my heart was challenged to continue ...... Continue to fulfill the plans my Heavenly Father has for me .... So many ordinary people are doing extraordinary things to make a difference , I was so honored to sit among them yesterday!! Good Morning!! Today while the amazing CIG crew holds down the fort for lunch , Shelby and I will be standing on a baseball diamond as the Idalou Wildcats honor the seniors that have played with pure heart and given blood, sweat and tears for the love of school and game. Over the last year I have thought about this day a hundred times ....... I remember the first time I ever sat in the stands as an Idalou Wildcat parent .....& today I will sit in the stands at the Idalou field for the last time as a parent ... I will now just be a fan. Walking into the grill this morning I had tears rolling down my cheeks.... This is the first of many last for my precious family. The game of a baseball ..... Yes it is just a game but it has taught my boys a lot about life. Happy Beautiful Friday y'all...... 14 years ago when my B first hit the ball off of a tee, I had no idea the journey we were in for....& 2 years ago when B chose to become an Idalou Wildcat we had know idea the impact that this school and coach would have on him......he has become apart of a school that builds character and has been coached by a man that emphasis a strong Christian faith before a strong arm. I am so honored to be able to experience this day today...... "In Baseball as in life, all the important things happen at home" ...... What amazing memories our family has shared "at home " , today may be the last home game , but we look forward to some amazing playoff games, hopefully makin our way towards state. I am proud to be an Idalou Wildcat & Proud to be a baseball parent thanks for the amazing ride B!! Good Morning!! .." I pray everyday that my heart does not become bitter or angry, so that I can still serve him".. My amazing guest are creature of habits. They order the same thing, usually drink the same beverage and usually comes in on the same day of the week( whatever their day is) When they get out of their routine I know there is something wrong. Last month I received a message to call Mrs.R. Mrs R is a catering customer & yes a creature of habit, never do we talk onthe phone about her monthly order....a week before it is that time of month to feed her husbands company she emails me, her and I never miss a beat, it works for us. When I was handed the message to call her my immediate response.." Was everything ok? Was she mad about something" breakfast slid into lunch and the message had slipped my mind..... Lunch was drawing to a close when Cindy comes to me and says "Mrs.R is on the phone"... "Oh mylanta is everything alright Cindy, she never calls!".... As I picked up the cradled phone my heart was pounding ..."Hey Mrs.R how are you,?" I knew instantly life was not good, sobs coming from the other end...." My husband has died Teresa" Happy beautiful Monday y'all... the conversation was heart wrenching, with both of us sobbing she tells of her love affair of over 30 years and how an aneurism stole him away in an instant. I listen as she shares .... Last week I receive another phone call from Mrs.R... It's that time Teresa I need to place the order after the order is given I ask how she and her boys are," lonely.... I walk around the house with no purpose it seems.We are still in shock that he is gone" her voice cracks as tears flows and she tells me of the love of her life.... A kind ,wonderful loving husband and dad and the one thing she really emphasizes... He was an awesome man of God ...& so she says the words written above" I pray everyday that mine & our boys heart's do not become angry or bitter so that we can still serve him" I sat and really thought about those words and they blew me away that in the midst of mind blowing grieve her heart is focused on serving the one true God . Are you in the midst of turmoil and grief ...think about Mrs R today and choose serving him over anger and bitterness... My favorite phrase " I choose to be better not bitter"
Good Morning!! ..... Over the last 6 months I have been avoiding a few different people, I have even gone so low as to hide in the kitchen for a whole hour( geez how embarrassing) so I would not have to speak to table 40, yes they were asking for me but was told I was unavailable ... Why? they wanted me to come and speak at a ladies conference a few weeks ago and I didn't want to... Another bold guest wanted me to speak at his church over the holidays ..... Yep I did it to him also, avoided him and finally told him I was unavailable .... I have shared over the last few years my fear of speaking .... My stomach starts hurting , my heart racing, my hands sweaty & my voice that I don't like anyway( yes I sound like a cartoon sometimes ) gets shaky and yep eventually tears .. And honestly what do I have to say that people really want to hear . Happy Beautiful Thursday y'all..... A few days ago this is what I read......"as I stood in front of my king of kings I ask him why he took me so early? You were not using the gifts I gave you and so I brought you home!!"... Wow hit me right between my eyes... It is really not about me and what makes me comfortable or happy or even calm , if it was I don't think I would be in this business but it is ALL about HIM what he is doing and to share with others the amazing journey he has put me on. Are you using the gifts he gave ? Or will you stand in front of him with these words" you didn't use the gifts I gave". My head and heart need to get on the same page..... It's not about me it's ALL about HIM....gosh it drives me crazy when he speaks and I have no choice but to listen.!!! !